No city does Broadway (and off-Broadway!) quite like New York. And kids don’t have to miss out on the experience of going to the theater just because they’re younger – it’s all a matter of finding them the right show. If your kid can sit through a two-hour movie or a marathon session of Nick Jr., they can definitely handle Broadway. Here are the shows that’ll capture their interest – and keep you enthralled, too. The Lion King provides the quintessential Broadway experience for families. It’s got everything – familiar songs, gorgeous costumes, stunning set design and effects. The opening number, where the actors parade down the aisles with the life-size animal puppetry, is a scene your kids won’t soon forget. The Gazillion Bubble Show is for anyone who likes to pop bubbles – which is, presumably, everybody. The one-hour show is great for the youngest of theater-goers, but parents will be captivated as well. There are bubble feats, sudsy science tricks, and a soapy laser light show. The best parts are when a giant wind machine blows thousands of bubbles (maybe even a gazillion) into the audience. 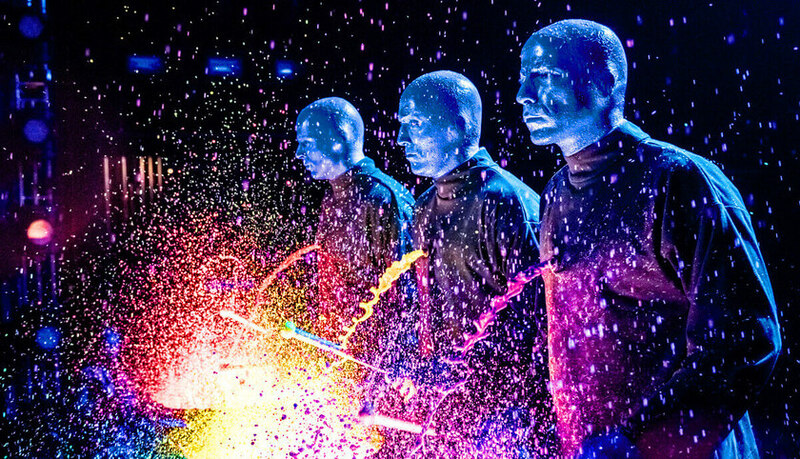 It’s hard to describe the Blue Man Group experience. It’s a rock concert, an exhilarating feast for the senses, and a wondrous display of unusual human talents all in one. Food is thrown around the tiny theater, and paint is splattered all over the stage. Giant smartphone screens are used on the set. And everyone in the audience is buried in a sea of toilet paper in the finale. Your kids will leave the theater asking if they could do it all over again. The quick-paced, catchy songs of Aladdin and hilarious antics of the Genie are what makes this show a standout and worth every penny. It’s also got the lavish costumery and dazzling set design of a quality Broadway performance, including a truly impressive magic carpet scene that’ll leave everyone wondering how it was accomplished. The performances given by the cast of Stomp is nothing short of amazing. You and your family will wonder how it’s possible for human beings to coordinate a show based solely on sounds and coordination. The audience participation is fun, and the energy produced in the intimate theater is downright infectious – and will stay with your kids long after they’ve left the theater. It's hard to not sing along with the Broadway version of Frozen, which follows the movie closely and includes all of its beloved songs. What makes the show truly special, however, are all the magical effects, from a sudden outfit change for Elsa to ice shooting across the stage. Your kids (and you!) will be wondering "how did they do that?” the whole time. Before you buy your tickets, make sure you check all the online resources for discount codes, including schooltix.com, broadwaybox.com, and playbill.com.